Elevator Action (1983) was one of the most popular arcade games of the period. 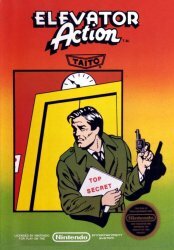 In this game, the player is a spy who sneaks into a building, steals some secret documents, and must descend the building, avoiding guards, to reach the getaway car below. The title helped redefine the spy genre by creating a detailed world and added many gameplay elements, such as enemies that can dodge by ducking and the ability to shoot out the lights (the fixtures can fall on enemy heads, giving you tons of points). Another big reason for its success is the main theme, which is very memorable. This is the NES version. The Elevator Action theme is really quite simple, but it is the simplicity of the melody and strong notes that make it memorable. The theme has a slightly uncertain feel from the wavering notes that also seem to work well for sneaking and encouraging evasion, but this also gives the track a slightly comedic feel that fits well with the game’s mayhem. It also feels slick with the pentatonic scale. Sadly, the NES version is monophonic, so it is not as rich as the arcade version. However, I chose this one as I do not have a version of the song without sound effects. Oddly enough, there have not been very many remixes of this song made. Certainly, the game has been remade a half-dozen times, but none of the mixes really stand out. I can’t find any fan mixes of this tune either, which was quite surprising. However, the Commodore 64 version had a brand new song by David Whittaker that is actually more of an action theme. The game was composed by Yoshino Imamura, who also composed Chack’n Pop, the predecessor to Bubble Bobble. I’m not sure if he’s the same guy, but there is also a Yoshio Imamura at Taito who composed Super Chase H.Q. and The Ninja Warriors. I actually had to wait a couple days to post this track. Game Music 4 All and Jeriaska just released a tribute album to Hiroyuki Iwatsuki (aka IWADON) they have been directing with over 20 artists from around the world. It’s a massive project with plenty of good stuff, so you should check it out. I was very excited about this album when I heard that Grant Henry (aka Stemage) of Metroid Metal fame had a track on the album. 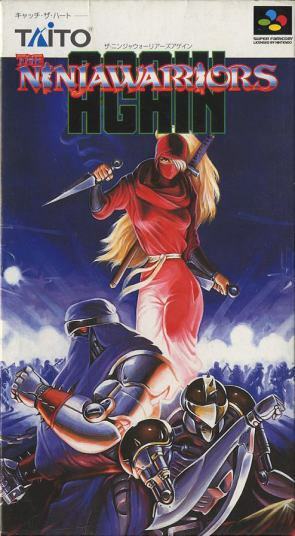 That track was the “Opening” and “Title” themes to The Ninja Warriors Again, a 1994 SNES beat ’em up loosely based off the original 1988 Taito arcade title, The Ninja Warriors. While this game had plenty of album releases, the SNES version never saw printing. Iwatsuki’s originals contain some incredibly cool sounds from the SNES sound chip, particularly the deep bass rumble the tracks open and end with. The “Opening” plays for the title video showing the story. Trumpets blare over a bass line to illustrate the desolation and horror that lies within the metropolis. The music is very cinematic, and produces a nice build that leads into the title theme. The title, though short, has a very catchy melody, a ray of hope cutting into the darkness – but one that is perhaps tinged with a bit of doubt (will the ninjas really stop afterward or will they turn into berzerkers?). The instruments are rock-solid. The fact that it plays over a logo that has little ninja people in the title makes it even better. Here is the video of the intro. Grant Henry’s rendition of this is amazing. While I can’t share the mp3, the track is currently available for streaming from the official website (he’s track number 3). Henry’s guitars pick up on the brooding nature of the original, taking great care to punctuate the track with drum beats and guitar breaks. The transition into the “Title” segment is also done well, and there is plenty of variation and development of the original track to fill in the last 1:40 of the song. Anyway, there are a couple really funny things about The Ninja Warriors (the 1988 arcade game). First, it’s got an absolutely hilarious ending screen (skip ahead to about 2:00). Second, it’s incredibly racist, with lots of slaying of demon-eyed black people (though I suppose you also get to kill flying bat-ninjas, so Resident Evil 5 isn’t quite there). Finally, the Sega CD release had some incredibly crappy voiceovers for the intro. Thankfully, the SNES version is more of a remake, with superior gameplay, graphics, and music (though they censored the ninja chicks and blood for the US release). I fell in love with this song the first time I heard it. 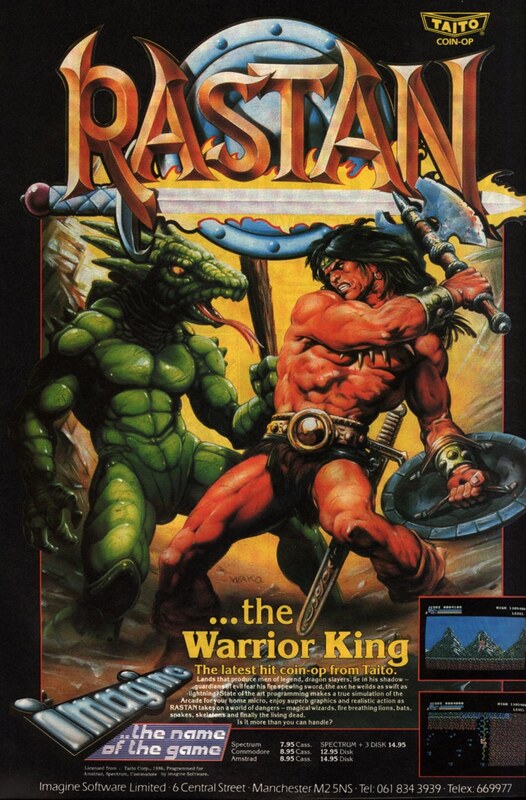 While it doesn’t have the pulse-pounding beat of the original, Glyn R. Brown’s mix of Masahiko Takaki‘s (Darius II, The Ninja Warriors) “Aggressive World” is a more sweepingly epic rendering of Rastan‘s Frazetta-esque barbarian vs lizard man action. Ok, the theme also evokes wide open country, hero-land with mountains and forest and desert, the kind of place a warrior can jump on a horse and ride through and seek his fortune. It’s a place ruled by sword and fang where stereotypical/archetypal supermen do what they’re designed to do and all the rest of the normal girly-men can imagine being in Conan’s shoes. Or leggings. I’m sure the woman singing the vocals is doing a great job telling us about Rastan’s mighty deeds, and some prophecy or somesuch. In any event, the drums, strings, and war horns are the “Blood and Trumpets” so fitting of an action game of this caliber. Read the rest of this entry ?